African penguins are among South Africa’s most charismatic creatures, capturing the hearts of thousands of visitors each year with their endearing ‘tuxedos’, monogamous mating pairs and comical, waddling gait. Previously dubbed Jackass penguins for the braying sound mates use to communicate with one another, these creatures are endemic to southern Africa – found in colonies along the coast and on offshore islands in the Western Cape, the Eastern Cape and Namibia. But the African penguin’s position is a precarious one: a 2008 census found that a mere 26 000 breeding pairs remained in existence, down from 150 000 pairs in 1956 and an estimated 750 000 to 1.5 million couples at the turn of the 20th century. This has placed the birds firmly on the IUCN RED DATA list, which cites them as ‘endangered. If numbers continue to decline at the same rate as they have in recent decades, the African penguin may no longer be with us in as little as 16 years. Fortunately these plucky seabirds are not fighting their battle for survival alone. Organisations in the Western Cape focused on sustaining them include the African Penguin and Seabird Sanctuary (part of the Dyer Island Conservation Trust) in Gansbaai, just a 2-minute drive from where we launch our shark cage diving boat, and SANCCOB (the Southern African Foundation for the Conservation of Coast Birds). SANCCOB has become recognised as a global leader in seabird rehabilitation and has unparalleled experience in dealing with avian casualties of major oil spills. 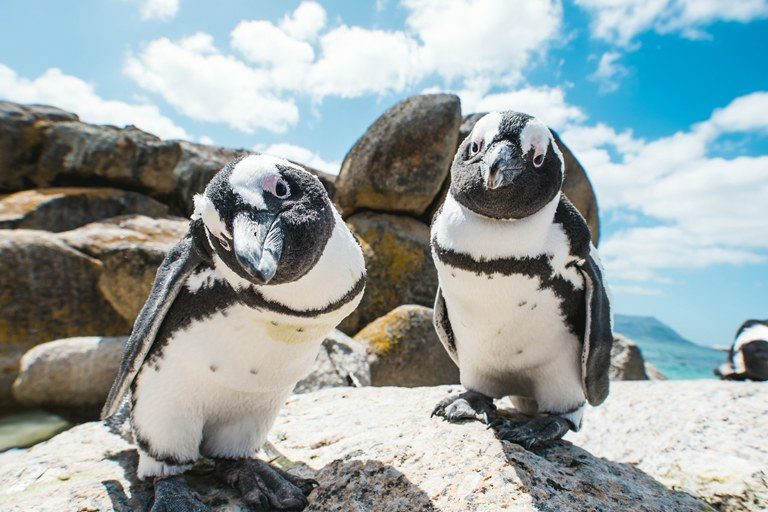 Research by the University of Cape Town’s Animal Demography Unit has shown that the African penguin population would have been 19% lower today in the absence of SANCCOB’s rehabilitation efforts. In the past, the greatest threats to the African penguin were human exploitation of eggs and guano but in recent years those factors have been overtaken by oil spills and food shortages. The greatest fear is that, because African penguins are flightless and live in close-knit colonies, a single oil disaster could be devastating. Oil spills are potentially fatal for individual birds, but they can also disrupt the entire breeding cycle: penguins mate for life and couple bonds are extremely strong, so when one of the pair dies the other usually waits two or three years before pairing up again. Not only this, but during the first 15 days, chicks are constantly brooded by one of the adults, while the other hunts for food. The demise of one adult can result in the rest of the family starving to death, as the other mate often refuses to leave the brood. Luckily penguins deal with stress better than most other seabirds so they are better candidates for rehabilitation, who often die from the sheer shock of being handled or transported. An example of their resilience was in the face of a major oil spill off the Namibian coast near Luderitz. Due to limited local resources, SANCCOB was asked to evacuate the endangered penguins to their centre in Cape Town, which is equipped to deal with up to 2000 oiled birds. Operation Luderitz saw 129 penguins transported 1300km to the centre for essential treatment, an epic road trip of 20 hours. Of those, 127 penguins survived the rehabilitation process and roughly a month later, 84 of the healthiest were released at Derdesteen Beach on the Cape coast to swim back north, each marked with a cerise ink splash for identification purposes, as well as a metal band on the left flipper. Eighteen days later, the first bird of the group was seen arriving at Mercury island off Luderitz, over 1 000 kilometres away. The same bird was spotted on Robben Island – less than 10 kilometres from the Cape Town – four days after being released from Derdesteen Beach. Given this confirmed sighting, it would mean that his actual swimming time from the Western Cape coast to Luderitz was an incredible 14 days, over which he averaged 72.7km per day. The struggle to conserve these precious birds will continue for as long as they remain in existence, say conservation groups. The cause for concern goes beyond just the penguins themselves: they are also an important indicator whose health reflects the wellbeing of the ocean. The current population plight is a red light signalling trouble with the wider marine ecosystem. The time to act is NOW – not just to conserve a single species, but the ocean in its entirety. There are 18 penguin species worldwide, but African penguins are one of only two species found along the African coast. The other is the extremely rare Rock Hopper penguin. African penguins have black faces with pink markings above the eyes and distinctive black and white ‘tuxedo’ coats. The back is black and the belly white with a distinctive black arch that runs over the chest and down towards the legs. Their white chests have unique, trademark black spots that enable researchers to tell individuals apart. These black and white coats serve a valuable camouflage function when penguins are in the water, disguising them from both predators and prey. Their black backs allow them to be covert in deeper, darker waters, while their white and black ‘tux’ fronts blend in with sky and seaweed, making them more difficult for predators to spot while close to the surface. This is known is scientific circles as ‘counter-shading’. African Penguins moult once a year, meaning they replace their old, weathered feathers with new ones – essential to maintaining their glossy coats, which provide insulation and are resistant to both water and wind. Leading up to moulting season, they need to put on roughly 30% of their usual body weight – for about 18 days whilst moulting they are not able to enter the ocean, so are without their regular diet of anchovies, sardines and pilchards. They have evolved to be spectacular water babies – their webbed feet and flipper ‘arms’ make them superb swimmers, while their heavy bones help them to be highly effective divers – a useful skill when plunging after a school of flash-fast fish. They are able to swim at speeds of up to 20km/hr, travel up to 40km in a day and dive as deep as 130m below the ocean’s surface. The life span of an African penguin is on average 10 to 15 years.